The high flow aluminum female quick coupler and plug set provide two times more air delivery than standard couplers and plugs. Each component is made of tough, rugged aluminum that is corrosion resistant. The high flow coupler and plugs are 50% lighter in weight versus conventional quick couplers and plugs. Bostitch Common Stick Nail - 2 In. The Campbell Hausfeld 15 HP, 120 gallon horizontal two-stage compressor is ideal for auto repair facilities and tire repair outlets. It includes a long-life cast iron two-stage pump, designed with over 15,000 hours of rated life. The head and valve plate feature an advanced design with Viton(r) high temperature o-rings for leak-proof sealing. Viton o-rings provide superior high pressure sealing compared to paper-type gaskets. Also, the crankshaft is fabricated of ductile iron and optimally balanced for smooth, low vibration operation. The Campbell Hausfeld 15 HP, 120 gallon fully packaged horizontal two-stage compressor (CE8003FP) is ideal for auto repair facilities and tire repair outlets. It includes a long-life cast iron two-stage pump, designed with over 15,000 hours of rated life. The head and valve plate feature an advanced design with Viton(r) high temperature o-rings for leak-proof sealing. Viton o-rings provide superior high pressure sealing compared to paper-type gaskets. Also, the crankshaft is fabricated of ductile iron and optimally balanced for smooth, low vibration operation. This unit includes and after cooler to remove excess moisture from the compressed air, an auto tank drain to make sure the tank does not fill up with water and vibration pads that reduce the amount of vibration the unit experiences extending its life. The Campbell Hausfeld 80 gallon, 5HP stationary vertical 1-Phase air compressor (CE3000) is ideal for a small shop, automotive enthusiast, or heavy DIYer. This unit will run high demand air tools such as sanders and grinders on a daily basis. The solid cast iron pump is designed for up to 12,000 hours of extended life, while delivering 14CFM at 90PSI. The durable 80 gallon ASME code tank is a vertical design for space saving in the shop or garage. 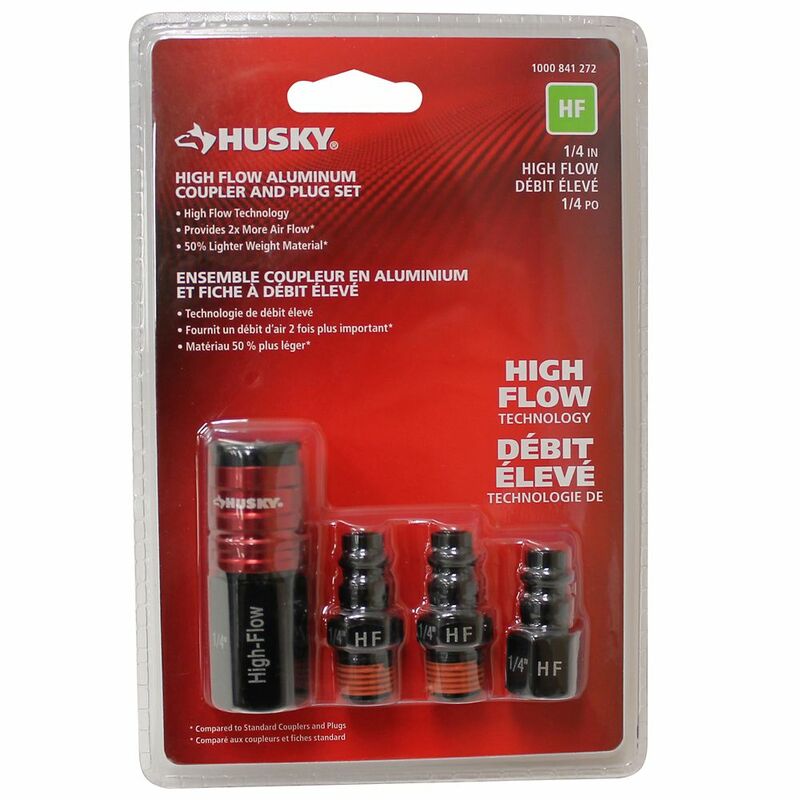 High Flow Coupler & Plug Set The high flow aluminum female quick coupler and plug set provide two times more air delivery than standard couplers and plugs. Each component is made of tough, rugged aluminum that is corrosion resistant. The high flow coupler and plugs are 50% lighter in weight versus conventional quick couplers and plugs.